Chichester (anc. Regnum), a city of England, capital of the county of Sussex, at the termination of a gentle slope from the South Down hills, 53 m. S. W. of London, and 14 m. E. N. E. of Portsmouth; pop. in 1871, 8,205. It is surrounded by an old but well preserved wall 1 1/2 m. in circuit, lined with elms, and forming a pleasant walk. There are four main streets radiating from a central square, where there is an elegant cross, erected in 1478. Most of the houses are of brick with tiled roofs, and many are built with considerable taste. The principal edifice is the cathedral, erected in the 13th century, upon the foundations of one erected in 1108, and exhibiting specimens of nearly every style of Gothic architecture. 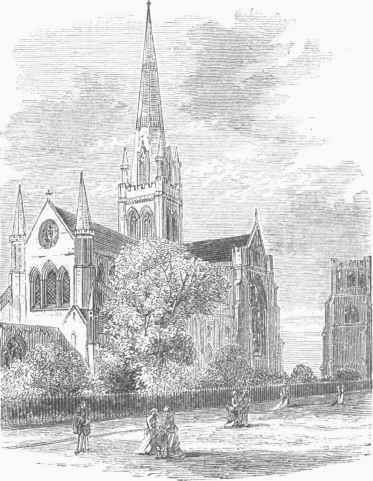 The beautiful octagonal spire, 300 ft. high, built in the 14th century, fell down in 1861, in consequence of some repairs which were in progress, and a new one was erected in 1800. One of its most striking features is a monument to the poet Collins, who was born and died in this city. It has eight other modern monuments by Flaxman, and many more of some antiquity. The extreme length of the cathedral is 407 ft., and its breadth 150 ft, The transept is 129 ft. long by 34 ft, broad. Near the N. W. angle is a massive bell tower, 120 ft. high, and on the S. is a quadrangle enclosed by cloisters and containing the churchyard. There is a blue coat school founded in 1702 and enjoying an income from endowment of £1,300 per annum. There are also a diocesan theological college, and a training college founded by Bishop Otter in 1841, with a model school attached to it, Two hundred years ago nearly all the needles made in England came from this town, but the only manufactures now are coopers' and other wooden ware, leather, parchment, and candles. Extensive corn and cattle markets are held. The town has communication with the sea at Chichester harbor, by means of a branch of the Arundel canal, used chiefly for the transportation of coal. - The name Chichester is supposed to be a corruption of Cissanceaster, the camp of Cissa, an Anglo-Saxon chief who repaired it after its partial destruction by the South Saxons under AElla in 491. It was the capital of the kingdom of Sussex till its conquest by the West Saxons. In December, 1642, the parliamentary forces took it from the royalists, and in 1048 the parliament caused its fortifications to be destroyed. The sec of Chichester was origjnally founded at Selsea in the 7th century, and removed to Chichester toward the end of the 11th. The income of the bishop is £4,200 a year. Chichester gives the title of earl to the Pelham family.